The collected poetry of Nikki Giovanni, 1968-1998 · One Book. One Author. One Hour. 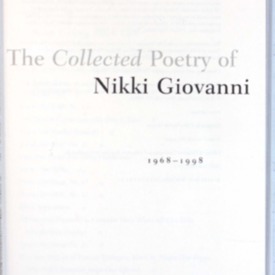 Giovanni, Nikki, “The collected poetry of Nikki Giovanni, 1968-1998 ,” One Book. One Author. One Hour., accessed April 24, 2019, http://booknotes.gmu.edu/items/show/643. For the first time ever, the complete poetry collection spanning three decades from Nikki Giovanni, renowned poet and one of America's national treasures. When her poems first emerged during the Black Arts Movement, in the 1960s, Nikki Giovanni immediately took her place among the most celebrated, controversial and influential poets of the era. Now, more than thirty years later, Giovanni still stands as one of the most commanding, luminous voices to grace America's political and poetic landscape.